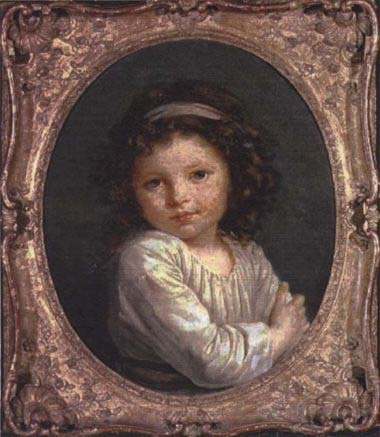 "La petite Fouquet [sic]" -thus she is recorded in the artist's list of sitters for the year 1786 -was born on March 17, 1778, at her father's country seat of La Grange near Thionville in the north of France. She was the elder of the two daughters of jean Gabriel Rene Francois, Marquis de Foucquet (1751-1827), a descendant of Louis XIV's famous Finance Minister. Her mother was the daughter of the First Intendant of the Parlement of Flanders, Blondel d'Aubers, and Marie Anne de Calonne. Marie Ren6e Louise was therefore the great-niece of one of Vigee Le Bruns most prominent sitters, the Controller- General, Charles Alexandre de Calonne (fig. 10). In 1792 "Reinette," as she was affectionately called, fled with her family to the Duchy of Luxembourg. From there they moved to Hamburg and were well received by the Landgrave of Hesse, Friedrich Ludwig. They then settled at Weimar, living on fairly intimate terms with the family of Grand Duke Karl August. The writer Goethe, the Grand Duke's minister, met her at this juncture and was smitten with her charms. "She is a veritable treasure...," he wrote, "gay, sweet, pure, well bred and pretty." And he added lamentingly: "If only she were wealthy and Lutheran." (F. Baldensperger, "Goethe et les emigres franqais A Weimar," Revue Germanique, 1911, p. 21). Bertier inherited La Grange, and she herself died there on June 12, 1845. 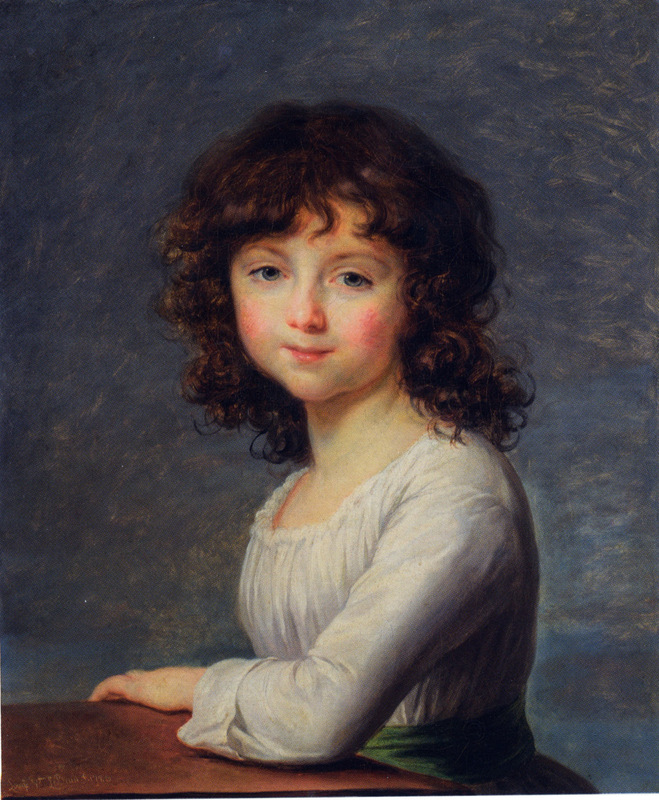 Mme Le Brun has invested this bewitching little girl with a maturity well beyond her years. The low-cut white dress encircled at the waist by a wide band of green silk emphasizes her bust which at the age of eight could hardly have been as developed as it appears here. The same self-assurance is expressed in the portrait of the saucy little Caroline Lalive de La Briche, also painted in 1786 and exhibited the following year at the Salon (fig. 22). In both these works, it is almost certain that Vigee Le Brun took her lead from Greuze's paintings of coy, pre-pubescent girls. Mlle Foucquet is shown leaning on a small wooden table. 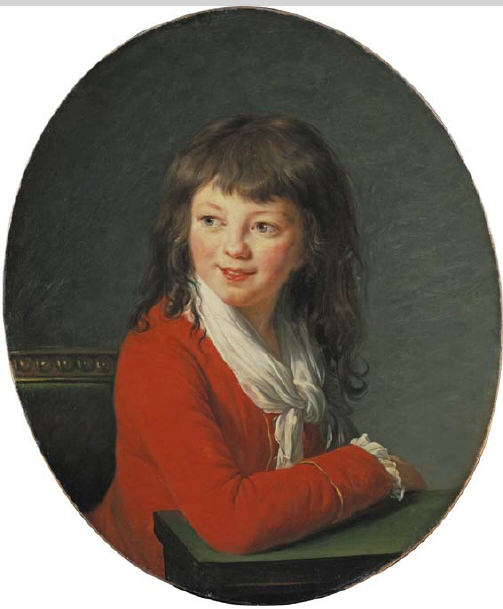 A similar prop appears in another child portrait of 1786, also shown at the Salon, the "petit d'Espagnac" now in the Wallace Collection, London (fig. 23). The technique is painterly and extraordinarily fluid. The child's unruly silken curls melt into the pearly flesh tones. The mottled effect of the bluish	gray background is achieved by scumbling. The epithet "Davidian" has often been applied to this technique. I was, however, not the invention of Louis David and was used, for one, by the Vigee Le Brun quite early in her career. A copy of this portrait, in which the the sitter is shown wearing a flower in her hair, was formerly in the Forrest collection, New York, where it was attributed to Greuze's pupil, Mlle Ledoux. PROVENANCE: The painting has remained in the sitter's family. EXHIBITIONS: Paris, Bibliotheque	National, Goethe, 1932, no. 442; Paris, Archives Nationales, Goethe et la France, 1949, no. 235, illus.